Semi-Permanent makeup involves the injection of pharmaceutical grade pigments into the dermal layer of your skin. This gives a shadow of colour that looks exactly like perfectly applied makeup. Escape the hassle and experience more self-confidence by starting the day with your eyeliner, eyebrows and lip liner already applied thanks to semi-permanent makeup achieved by cosmetic tattooing. Ideal for women always with minimal time to apply makeup. Physically active and athletic women who wish to avoid makeup running during their activities. People who wear glasses or contact lenses who have difficulty applying makeup. Correction of uneven facial features, overplucked eyebrows or thin and poorly defined lips. 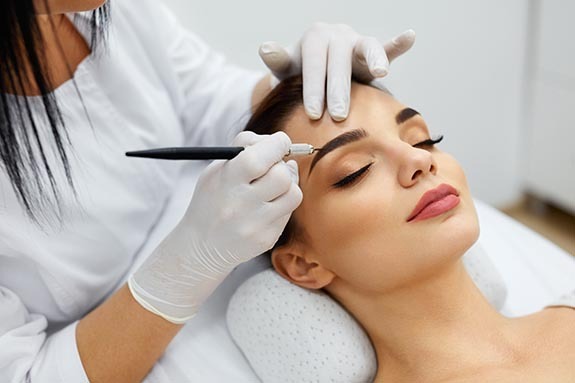 The term ‘Semi-Permanent Makeup’ implies long lasting, generally lasting 3 to 5 years You may require a touch up every couple of years to refresh the colour. This can allow flexibilit to change the shade of colour or shape to suit your changing lifestyle. There is an initial consultation and treatment where the colour and shape are established first with a pencil and all questions are answered to ensure the client is 100% satisfied before we proceed. Two types of Anaesthetics are applied throughout the procedure starting with a topical anaesthetic prior to ensure the upmost client comfort. Single use, sterilised needles ensure no cross-contamination and complies with strict health regulations. After the procedure you will need to return approximately 4-6 weeks later for a Perfecting Session. This perfecting session is included in the initial cost and is essential to ensure the colour, shape and effect are perfect.